Hide, by Matthew Griffin. New York, New York: Bloomsbury Publishing, February 2016. 272 pages. $26.00, hardcover. 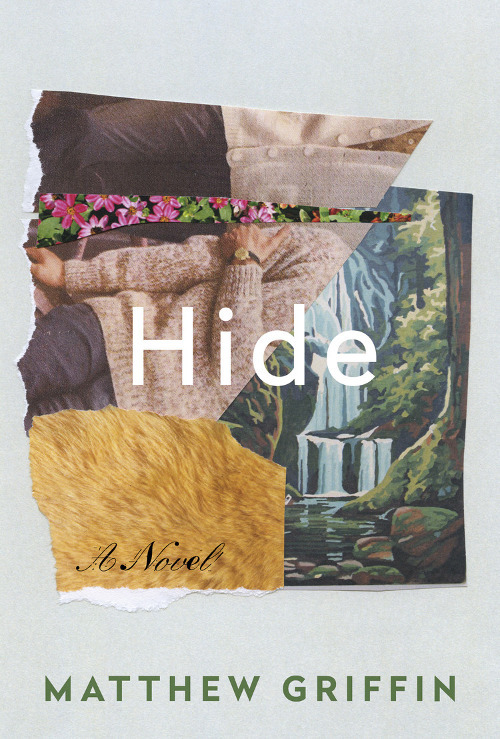 Hide, Matthew Griffin’s tender, funny, and engrossing debut novel, is a love story. But an odd love story, a sort of alchemy between the sturdy, old-fashioned mores of the Greatest Generation, and the newfangled deconstruction, or at least complication of those mores, that frequently mark contemporary literature. The lovers are Wendell Wilson and Frank Clifton, a couple living somewhere on the outskirts of Raleigh, North Carolina. Their story is, in many ways, a simple one. Their romance hits—quite deftly I might/am currently add(ing)—on many of the expected beats; there’s a serendipitous first meeting, a courtship complete with the two would-be/will-be lovers stargazing beneath a cloudless night sky in the rural countryside, and a tasteful consummation of each character’s ever-amassing desire. In many novels, this would be enough (in fact, if you slapped a picture of two blandly handsome men almost kissing on the cover you might have a bizarro, infinitely better-written Nicholas Sparks novel). But in Hide, this is merely the exposition, parsed out in flashbacks throughout the novel, and instead the real story is Wendell and Frank’s life in the decades after their union, in what they gained through their life together, but also in what they gave up, an accounting of the opportunity cost of love. Hide begins with Frank, eighty-three, collapsing in his beloved garden, or having a “spell” as told from Wendell’s POV, the result of a stroke that quickly gives way to dementia. This event shapes the narrative, conscripting Wendell into the role of caretaker, guiding an often ungrateful Frank through self-destructive outbursts and episodes, and leaves him unsure if he should try to preserve the hope that Frank will get better and their life will return to what it once was, or extinguish it and accept the new reality of their last few years. Throughout the novel, Griffin applies a sort of lyrical grotesqueness to aging. Bodily decay and the specter of death loom constantly—seeping into every crevice and silence and mundanity—a threat externalized into the house itself; it’s Frank’s job to clean, so their lives become dirtier and unkempt, creeping closer and closer to collapse, as Frank’s condition worsens. There’s also a profound sense of claustrophobia, as Wendell and Frank are forced into a near-hermetical existence in order to escape the bigoted gaze and absurd illegality of their relationship. They rarely go places together (and when they do, it’s always under the guise of being brothers); refuse to admit anyone, even family, to their house; and live like spies or outcasts or unpopular spies living as outcasts. But the isolation takes a psychological toll beyond a mere inconvenience, particularly with Frank, whose persistent fear of exposure seems to betray a sense of genuine shame about who he is and the relationship he’s chosen. In Hide (like all apt one-word titles, it has a duel meaning; it’s the intransitive verb that Frank and Wendell spend most of their life doing, and it’s the thing that Wendell, as a taxidermist, works with), metaphors abound. Frank grows more and more like the dead animals Wendell taxidermies, a—to chose a word entirely at random—hide of himself, sturdy and still present, but with all the life emptied out. There’s also the persistent drone of the TV, faintly reminiscent of White Noise, that persistently intrudes into their life. Most particularly, they watch court shows and eventually become deeply invested in the disappearance of Little Larry and the pleas of his suspiciously glammed-up, overworked mother to help find him. Aside from the humor (octogenarians react to TV in ways that are rarely uncomical) Griffin draws a neat parallel between Little Larry and Frank, and by extension, Wendell and the mother, preserving the tension that an Of Mice and Men–style mercy killing might await at the novel’s end. There is also a strange rupture, encroaching even on the surreal, in the diction between Wendell’s dialogue and his thoughts. In speech, Wendell is gruff to the point of curtness, prone to nags and laments, begging Frank to help himself one minute, while chastising him for his failure to do so the next. Wendell is averse to change and frequently exasperated that the world, most often Frank, fails to know what he knows. But in thought, Wendell sees the world with the depth and nuance that transcends his taciturn demeanor, thinking poetically of clouds and nights skies and the worn-out desperation of the world around him. The tone veers, quite deftly, between comedy and pathos, particularly in an extended scene when Frank, in the throes of sickness and mental decay, refuses virtually all food—complaining it all tastes like metal—prompting Wendell to exhaust every recipe he knows as he cycles through Frank’s favorites, and then through just about every cake in existence once Frank expresses an interest in sweets. They finally settle on packaged fruitcake, which incenses Wendell because it’s fruitcake and he can still taste things. But the dominant thread in the novel is Frank and his rapid mental and physical diminishment. The dementia, as is its wont, peels away his memories, leaving Frank a raw, impulsive, quasi-sociopath, twisting and knotting his consciousness into a deranged man supreme in his confidence that he’s not the least bit deranged, cutting vast swaths of terror and destruction wherever he goes, including a beautifully written, but deeply traumatizing accident with a beloved pet. The dementia, though, serves a second, even more fascinating narrative purpose, opening a kind of parallel reality, like a tear in the fabric of time and space. In this alternate history, told through Frank’s waking dreams and hallucinations, their union never happened, and Frank is the father of a six-year-old daughter, while Wendell is his actual brother. The underlying question to all of this—both the fugue state of dementia and the story itself—is whether or not it was worth it for Frank and Wendell, to give up what they lost in order to gain what they had—and though Griffin offers an answer to this question in the novel’s poignant, compelling, and ascendant final act, that answer is like the characters themselves, romantic but not naïve, skeptical without cynicism. Paul Albano has a PhD in fiction writing from the University of Louisiana at Lafayette. His work has appeared in Cream City Review, Paper Darts, and Whiskey Island Magazine, among other places.